So when you show them big things like the Sydney Harbour Bridge, they naturally want to scale those, too. "Please, can I climb the Harbour Bridge, Dad?" my daughter, Jaspar, pleaded. "You only need to be 10 to get to the top and I'm already 12." So, keen to provide my daughter with a highlight (a low pun there!) for her school holidays in Sydney, I organised some quality father and daughter time on top of Sydney's famous "Coathanger". 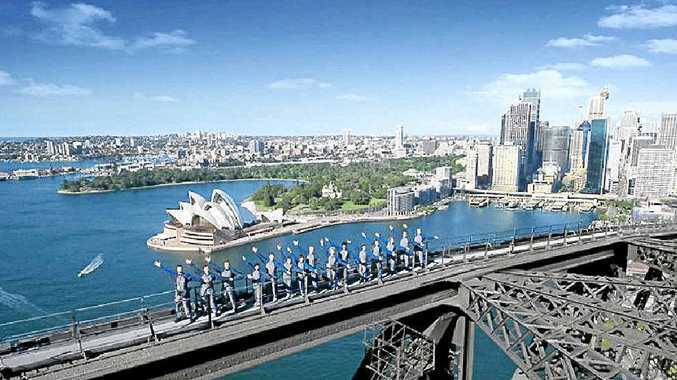 More than 2.75 million people aged 10 to 100, including celebrities such as Oprah Winfrey, Kylie Minogue, Prince Harry and Justin Timberlake, have now reached the top of the harbour city icon since BridgeClimb Sydney opened in 1998. About 4000 of those climbers have been romantics who have proposed to their other halves so their engagements can start on a high (just extending the pun!). For kids, climbing to the top of Sydney Harbour Bridge is just as exciting as visiting Disneyland (and although it's a premium experience, it's much cheaper than flying to America). In fact, Lonely Planet labelled BridgeClimb as one of the world's top 10 adrenalin experiences. The excitement builds as you don your safety costume, harness and cap and remove anything that can fall off and tumble from the apex of the 134m-high arch on to drivers, pedestrians and boat passengers below. The 3½-hour, 1300-stair experience begins with walks along mesh catwalks, up ladders and on to the arch of the bridge itself, with early nerves soon replaced by exhilaration as you seemingly float higher and higher above what surely must rate as the world's most spectacular harbour. "I can't believe we are actually doing this," a glowing Jaspar declares. "This is just awesome Dad. "I'm finally climbing the Harbour Bridge." Our jovial tour guide points out places of interest around the harbour along the way, stooping to his own low puns by saying that the BridgeClimb is such a "riveting" experience because of the six million rivets which hold the sturdy 80-year-old bridge together. Opened in 1932 and boasting 53,000 tonnes of steelwork and 272,000 litres of paint, the Harbour Bridge remains the world's largest steel arch bridge and one of the world's widest bridges (49m), with a long future ahead as one of the international symbols of Australia. The view from the top is astonishing - a "top of the world" exhilaration that takes your breath away, literally. We drink it all in, wave to ferry passengers far below and eventually descend back to earth, much the richer for the experience we have shared together, creating memories far longer than the climb. "Thanks, Dad. That was the best," Jaspar beams. "But can we get lunch now? The minimum age to climb the bridge is 10. BridgeClimb rates start at $188 for adults and $128 for children (10-15).